We are rapidly approaching the festive season here in Bucharest, as November brings two important Romanian holidays celebrating Archangels Michael and Gabriel on the 8th, and Saint Andrew on the 30th. The crisp air plus the mentioned above reasons to celebrate make most of us want to enjoy the Bucharest nightlife, filled with entertainment and good times in comfortable and fun designed spaces. The Bucharest nightlife is mostly concentrated in the many pubs, rooftops, restaurants and clubs located in Bucharest’s Old Town. Why? Because the Old Town in Bucharest is right in the middle of the city, in a central and picturesque area that drives a lot of foot traffic. This area is also where you will find Concorde Old Bucharest Hotel, with its beautiful architecture details and ultra modern and comfortable rooms. It is one of the best positioned hotels in Bucharest, Romania. Stay at Concorde Old Bucharest hotel for a convenient taste of the Bucharest nightlife, pretty sights and great hospitality service. A hotel situated in the middle of a party neighbourhood might not sound comfortable, but after all the renovations the building of Concorde Old Bucharest Hotel went through, you can be sure that inside, you will find a secluded and quiet space. Concorde Old Bucharest Hotel was created to be a relaxing and serene accommodation, having the convenience of being within walking distance from many of the city’s attractions. From your comfortable room at Concorde Old Bucharest Hotel, you will make a short walk to one of the best restaurants in Bucharest. The iconic restaurant Caru’ cu Bere is only 500 meters away from the hotel, and there you can enjoy authentic Romanian cuisine paired with a refreshing beer that was created in 1879! Besides the delicious food, Caru’ cu Bere is an exciting restaurant because of its design and wonderful atmosphere. 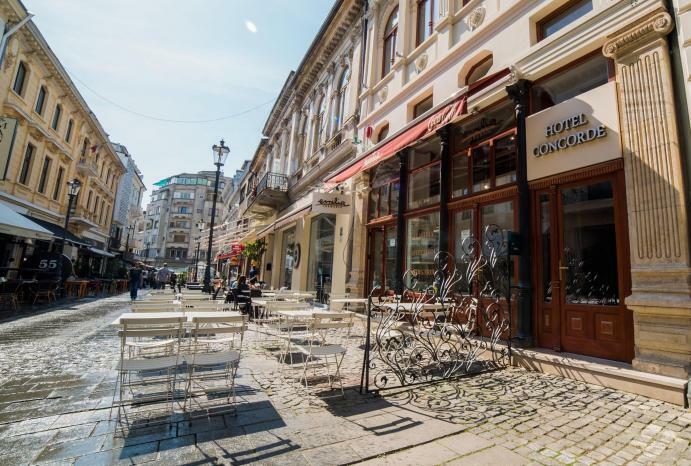 The building hosting the restaurant has been declared a historical monument and it is, by now, an iconic place in Bucharest. Dinner has never been a more delightful experience! After dinner, it’s time to go out and sample some of the Bucharest nightlife hotspots - thankfully, in the Old Town, this is an easy job. Everywhere you look, pubs, bars and restaurants are one next to the other, waiting for you to come in and join the party. One of the most popular bars in the Old Town is Shoteria, located only 2 minutes away from our hotel! The 160 meter distance from the bar to your hotel is definitely a plus, especially after you’ve had a few drinks :) Shoteria specializes in serving creative and tasty shots which will soon make you feel like dancing. Head over to Nomad Skybar, just a few steps or 1 minute away from Shoteria, and hit the dance floor! Nomad Skybar has a chic decor and a lovely view of the Old Town. The music and drinks will keep you entertained all night long, as you’ll party in one of the best clubs in Bucharest. The stylish skybar is a hotspot in the city, making it a popular destination for party people, especially during the weekends. For a taste of the fun Bucharest nightlife, drop by Nomad Skybar and dance the night away! Bucharest nightlife in the Old Town cannot be complete without live music performances. If live music is more to your liking, True Club, located on Covaci street - only 5 minutes away from Concorde Old Bucharest Hote -l might be the place for you. This club has karaoke nights and live music performances from local bands. Drop by and enjoy live music and entertainment, just a few steps away from the quiet hotel! 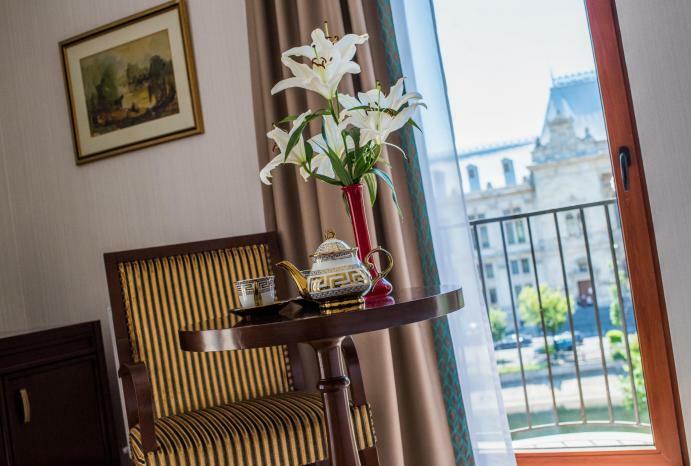 The Bucharest nightlife in the Old Town is hedonistic and loud, but thankfully, once you step inside Concorde Old Bucharest Hotel, you can enjoy peace, quiet and a good night’s sleep. The comfortable accommodation has memory foam mattresses, warm colors and pleasant textures in all rooms, making this hotel a very chic experience in Bucharest. Stay in a deluxe double room and, after a night of eating, drinking and dancing, you will wake up rested and pleased. The complimentary coffee kettle will be there to help you bounce right out of bed! After that, you can head to the massage area and sauna, where you can unwind and detox your body after a night of partying. A fitness room is also there for you, at Concorde Old Bucharest Hotel. The four star hotel in Bucharest, Old Town is the perfect place if you’re a fun loving person who likes to enjoy socializing, dancing and having a good time. If you fit this pattern, don’t waste any time and book your room now!